June 2, 2012, 12:53 PM · Musicians know instinctively that the study of music enhances our thinking and communication skills, but how can we prove that to school boards that want to cut our programs, politicians who view music as a "frill," and a society that views music as entertainment, with no concept of music as a discipline for serious study? Perhaps if we can present some solid, scientific proof, we can take our argument farther. Dr. Laurel Trainor, a professor in the Department of Psychology, Neuroscience and Behavior at McMaster University in Ontario, is assembling just that kind of body of work. She is Director of the McMaster Institute for Music and the Mind, which recently received a $6 million grant from the Canada Foundation for Innovation for the scientific study of music. She spoke to us at the Suzuki Association of the Americas Conference about her studies so far, and what discoveries they have made about how music affects the brain. "From a very early age, infants have certain musical preferences," Laurel said. "One of those is for consonance over dissonance." She showed a video in which six-month-olds listened to Mozart, then to dissonant patterns. The infants clearly lingered over the Mozart, whereas they turned away quickly from the dissonant sounds. Another interesting discovery her team has made was that a short amount of listening to a certain timbre enhances the encoding of tones in that timbre. For example, a child who has listened frequently to guitar music is better able to process guitar music than he is able to process the same tune, played on a marimba. The brain changes neurally to process those tones. Also, musical enculturation happens very early. "What infants are hearing, really matters," she said. "Your brain, from listening to Western music, will become specialized for Western music. Already by one year, this enculturation process is happening." Musical training actually accelerated infants' acculturation to Western tonality. "The environment in which they are raised has a big effect on their musical learning." With one year of Suzuki training (yes they studied Suzuki students specifically), a child's musical discernment was significantly greater than their peers with no musical training. "So music lessons accelerate the acquisition of musical skills," she said. That may be obvious, but it's good news that science bears it out. But not only that, musical training had an effect on children's burgeoning reading skills. "Even controlling for age and socioeconomics, there is a correlation between how long they have been taking music lessons and their reading ability," Laurel said. I'll be very honest with you, I'm not sure about the specifics regarding the above chart. 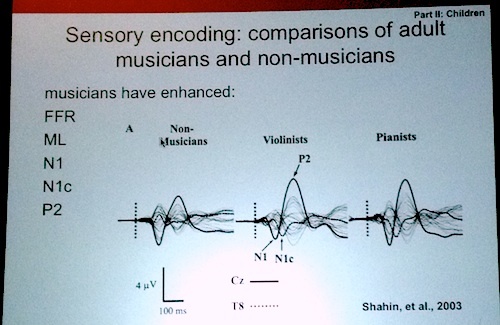 But clearly it shows that violinists have enhanced FFR, ML, N1, N1c and P2 (whatever those things are). It makes me feel quite brainy! But I'll try to explain it as Laurel did: the brain has more feed-back than feed-forward capacity. In other words, it has the ability to take in things, but it has even more ability to process those things. What this means for music is that "if you know what to listen for, you can hear it better." This power of the brain to review, analyze and anticipate based on past experience is called "executive function." Musical training effects "executive function" development, and those functions were found by this scientific team to be "two to three years advanced in kids who are taking Suzuki." I look forward to hearing about the results of their experiments in the future, and I hope that having some scientific proof will help us in our endeavors to create a more musically-educated society. June 3, 2012 at 04:10 AM · Its been awhile since I took a neuroscience course, but I think N1 N1c and P2 refer to components of evoked potentials (recorded electrical activity in the human brain) in response to a stimuli (in this case sound). It gets confusing, but the components are labelled according to how it takes after the stimulus for them to emerge in the brain (N1 is around 100 milliseconds, N1c about 140ms, and P2 around 190ms). It seems that the N1c and P2 components were stronger in musicians than non-musicians. This may suggest that musicians' brains are still reacting strongly to a sound over a longer period of time compared to non-musicians (although we are talking about milliseconds here). If I'm interpreting this right, the brains of both musicians and non-musicians are reacting equally to a sound at around 100 milliseconds (there appears to be no difference in N1 between the groups). 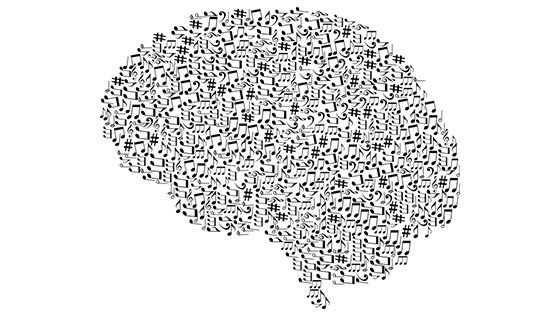 However, the musicians' brains seem to still be going strong later (N1c and P2) after the non-musicians' brains have slackened in their reaction. Thats my interpretation based on knowledge learned some years ago. Am I right? Maybe. Maybe not. Is there a neuroscientist in the house? June 3, 2012 at 04:30 AM · Thanks Wayne! June 5, 2012 at 07:39 PM · Whether correlation is related to causation is always tricky to sort out in these types of studies. I'd like to think that musical training enhances the development of executive function in everyone, but I don't see anything that proves that over another possibility: that kids who already have advanced executive function at an early age are more likely to succeed at and stick with musical training. I remember when my daughter was not doing well at Suzuki training, I was talking to another mother at the same music school whose son was older and was now learning to play the electric guitar. She said that when he was younger he had lasted for 3 weeks in Suzuki and had spent those three weeks running around the room pretending he was an airplane and making airplane noises. At the time, he just didn't have the executive function necessary to succeed with music lessons. A few years later, he did. I found that conversation somewhat reassuring.